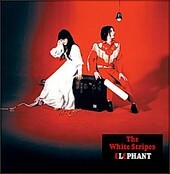 Following the gold-certified record White Blood Cells, the band's first record for a major label, Detroit-based The White Stripes raise the bar on themselves, once again combining spark-driven punk, fierce garage rock, and burning blues, with Elephant. Elephant is fourteen tracks that examine the balance between the beauty and dark side of love, as Jack and Meg White catapult Jack's wry humor and sly lyricism into guitar-soaked, soaring rock anthems, shaking with blues traditionalism and punk rock minimalism. "In The Cold, Cold, Night" is Meg's turn to sing, her sheepish voice sounding hesitant and reserved, the subtle, silky music blanketing you like the darkness of night. While the remaining tracks (sans the comical album closer, "Well It's True That We Love One Another", which features Holly Golighty and Meg alongside Jack) trash and crash down much like love, as Jack leads the ship. Though the band is best on the powerful numbers, tender moments like the acoustic "You've Got Her In Your Pocket" and the piano ballad "I Want To Be The Boy To Warm Your Mother's Heart" show a gentler, more smooth White Stripes. A beautiful retreat from the roar and thunder of the band's other cuts. Then again, songs like "The Air Near My Fingers", "The Hardest Button To Button", and "Little Acorns" rip through the air with restlessness and relentlessness, their antsy, hyper beats fueled by their succulent melodies, while the propulsive rhythms tackle the song and take over. An engaging, well-produced collection of some of the best blues-punk-garage fusion out there, Elephant is a fine follow-up to The White Stripes break through. I'll give it an A.